Jennie is Dr. Killebrew's assistant and has worked in the dental field almost 32 years. She graduated from Pima Community College in 1985. Prior to her dental career she studied social welfare. She has been working with Dr. Killebrew for 26 years. The thing she loves the most about her job is not only helping and caring for people but the relationship she gets to build with her patients. She is very committed to making sure her patients feel as comfortable as possible. She enjoys working with Dr. Killebrew and helping patients receive the highest quality dental care as well as enabling them to have an enjoyable experience at the office. In her free time she enjoys reading, watching movies, swimming, volleyball, the outdoors, cooking, growing plants, and being a grandmother. Jayne grew up on the East Coast in a suburb of Washington D.C. After attending the University of Arizona for two years, she transferred to Virginia Commonwealth University and graduated with a Bachelor of Science degree in Dental Hygiene. However, after spending two winters in Arizona, she decided to move back to Arizona permanently after graduation, and has been here ever since. Jayne has lots of interests and hobbies, including movies, photography, and a small business making jewelry. Jayne believes in educating her patients so they can take control of their own care and lead healthier lives. 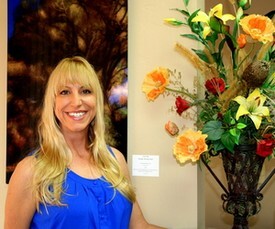 Tina has worked with Dr. Killebrew for 9 years now. She began as a dental assistant and went back to school for dental hygiene. She graduated from Pima Community College in 2003. Tina really enjoys her profession and loves working with people of all ages. She has enjoyed learning and educating over the years. Spending time with her family has been her greatest joy. She also enjoys playing with her two dogs. In the spare time she loves to go places and see new things with her family.